Will he “come back”? Will Emmerich Kalman succeed in duplicating the tremendous success of his Countess Maritza, which has been the operetta sensation of Vienna – and Vienna is still the operetta center of the world – for the past two years? That was the question which hovered on the lips of the brilliant audience which assembled at the Theater an der Wien, Vienna, for the first performance of The Circus Princess. Cover for the original piano score of “Zirkusprinzessin,” 1926. Kalman has created almost nothing but sensational successes for twenty years past. From Der Zigeunerprimas, known in America as Sari, to Countess Maritza there stretches a long series of operettas which not one was really an outspoken failure. Kalman beats all his famous colleagues in this respect. Lehar has had several failures, although his most famous piece, The Merry Widow, reached the record of 500 consecutive performances at Vienna. Oskar [sic] Straus has not been equally happy with all his works, and even the most popular of them, The Waltz Dream, with 600 consecutive nights in Vienna, still remained by a full 100 below the record which Kalman established with Maritza. 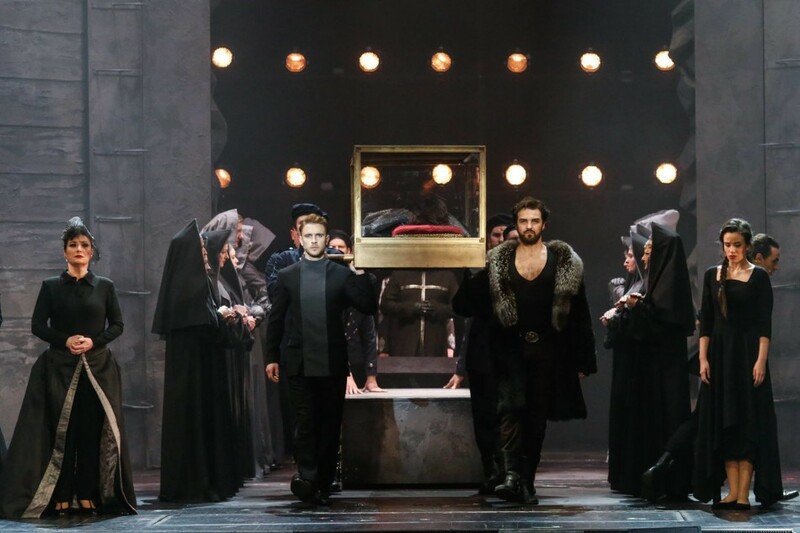 It has been going for over 700 nights at Vienna, in an uninterrupted run, reaching the highest number ever established by any operetta in that traditional operetta city, Vienna. It is estimated that Kalman cleared eight billions of Austrian crowns on this piece so far – and even before it has crossed the Channel, much less the Atlantic. Eight billions! It sounds formidable. Figuring in the currency of Irving Berlin, it is barely $90,000, a mere trifle. But one of those sensational retrospective Viennese statisticians has just figured out that the average income of Franz Schubert – one of Kalman’s early colleagues and not the worst one of his time – amounted to approximately 60 florins, or 24 dollars a month. So, after all, Herr Kalman ought to be dissatisfied with his success. The verdict of the first-nighters was unanimous. 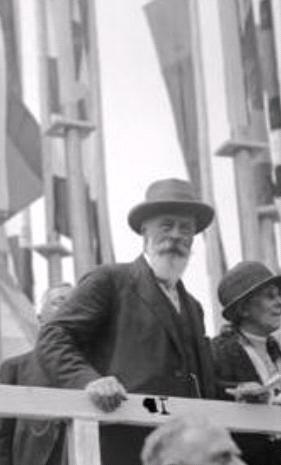 From President Hainisch, the venerable head of the Austrian Republic, down (or up) to the ice-cream boy in the gallery, there was only one voice of enthusiastic approval; and the theatrical managers who had come from near-by Budapest, from far-off Berlin and still more remote Paris and London to witness what was an avowedly international artistic event and to secure their performing rights while they were still to be had at a bargain, shared the general opinion. No less than forty contacts had been signed two days after the première by the managers of as many European theatres. Kalman’s librettists stick to the aristocratic environments which are a time-honored requisite of successful Viennese operettas. Their hero is “Mr. X.,” a “man with a past,” a Russian grand duke, like his more democratically inclined brother of The Orlow fame. But so far from toiling for American capital, he has chosen the more lucrative career of a circus artist. He is brave as Russian grand dukes are wont to be in operettas, and no less sentimental than his more lowly born brethren of the tenor variety. This grand duke has left the Russian army and his princely home (we are still in pre-war Russia) to escape his mad and unhappy love for the betrothed of his uncle. She is, quite naturally, also a princess and as beautiful as princesses must be – in fairy-tales and operettas. Exchanging his gilded officer’s uniform for the sulky yet most becoming attire of a lovesick Pierrot, his heart bleeding with sorrow over his lost Leonore, Mr. X. performs his merry stunts amid what a Freudian might term the “Pagliacci complex.” This operetta composite of Lon Chaney and Sylvester Schäffer even sings his “Ridi Pagliacci,” which clever Emmerich Kalman has clad in a less dramatic but more timely 2/4 rhythm. Needless to say, the vainly loved princess, who has meanwhile become a widow – and a rather merry one – turns up in the circus and immediately proceeds to do what is has been the lot of operetta princesses to do for many years past: She falls in love with the princely Lon Chaney. She outdoes even her sisters of the operetta type for weak memory. She does not realize the identity of Mr. X., the mysteriously masked man, and does not even recognize her one-time suitor when he enters in the glorious dress of the Russian Life Guards to exchange rings with his beloved. When she ultimately realizes that she has married a circus artist, and has thus merited the title of the operetta – this situation provides the indispensible and strikingly melodramatic finale of Act II – she turns in disdain of her mésalliance and dismisses her betrothed without even allowing him the bridal kiss. In the third act, of course, everything is mended. The princess, having realized the high rank of her newlywed husband, receives him back with open arms. And aristocratic superstition and true love triumph in the end. 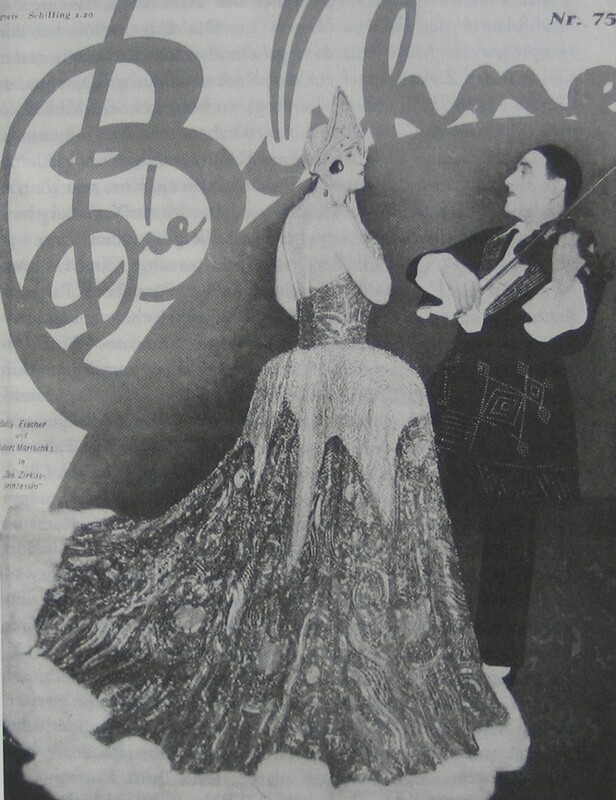 Front page of the magazine “Die Bühne” showing Betty Fischer and Hubert Marischka in their “Zirkusprinzessin” costumes, 1926. The librettists have done good, practical work. 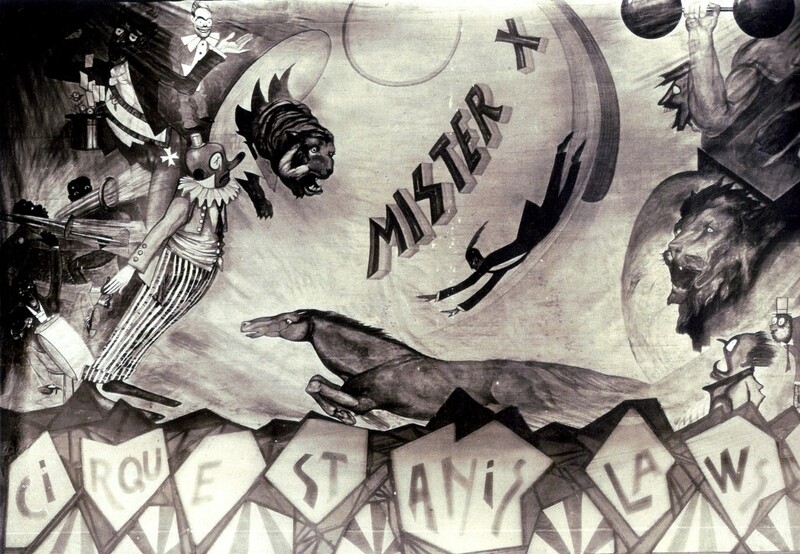 The first act, with its atmosphere of the circus, is excellent as an opportunity for display and fun. No pains are spared: a “pony ballet” of handsome girls vies with a fine live steed on which Mr. X. makes his triumphant entrance in the ring. Twelve trained dogs perform their antics, and the acme of hilarity is reached when a trained goose wends its noisy way across the stage, the poor fowl emitting wailing sounds and showing palpable annoyance over the unwelcome attention of the people on the stage and in the front of it. With all its conventional features, the book is very good: it serves as a pretext for wonderful settings and affords Kalman, the composer, the cues for finely colored music. Kalman, experienced craftsman of operetta, has missed none of these opportunities. The circus environment gives him a chance for nice parodistic music: a clever imitation of a Dutch band, with Stravinskyan “false basses.” The Russian ballet in the second act finds him well armed with genuine Moscovite rhythms, and the third act, laid in Vienna, draws forth at least one very enticing Viennese melody with the characteristic “thirds” in the accompaniment of soothing violins. And, of course, his native Hungarian predilection for Magyar strains is not suppressed in the brisker scenes. Kalman shuns the charms of the saxophone, but revels in stuffed trumpets of all varieties now and then, and challenges his American colleagues for “pep” in the topical dance pieces. The waltz – the homeland of Viennese operetta – is drawn upon for the lyric passages and with great skill. The ghosts of “Mariza” and “The Csardas Princess” walk through the score of his new operetta, especially in those pieces which are evidently calculated to become the “hits” of the piece – notably the electrifying “Budapest” duet of the first act and the caressing “My darling” of the second. Self-plagiarism? To some extent, indeed. But happy the composer whose productiveness is great enough to allow of some self-plagiarism without relegating him to the necessity of unhyphenated plagiarism pure and simple. 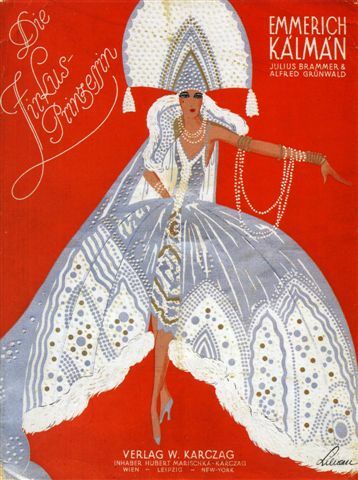 The curtain for the original Viennese “Zirkusprinzessin” production 1926. The production is marvelous. It has Broadway standard – not quite, perhaps, in the settings, but decidedly so in the costumes, which were both artistic and gorgeously costly. The Theater an der Wien, the historical playhouse where Mozart once saw the first performance of his Magic Flute, where Johann Strauss had his great classic operettas produced and where Franz Lehar, Oskar Straus and Leo Fall made their reputations, has a past to live up to. Hubert Marischka, its owner, stage manager and star, is a sort of Viennese George M. Cohan: a charming producer, actor, singers and dancer – and an accomplished violinist at that. Betty Fischer, the heroine, is an old Viennese favorite. But she wears stunning gowns, and wears them exceedingly well. The histrionic high light, aside from Marischka’s masterly impersonation of the prince, is Hans Moser, who creates a type sui generis in the rôle of a Viennese hotel waiter. This comedian, whom Max Reinhardt brought into sudden prominence, has the gift of evoking infinite hilarity and gentle emotion in quick turn by means of his deeply human humor and with the most economic means. He carries the entire third act on his slim shoulders and on a pair of legs so pathetically rotund and so hopelessly crooked as to make a Charlie Chaplin turn green with envy. 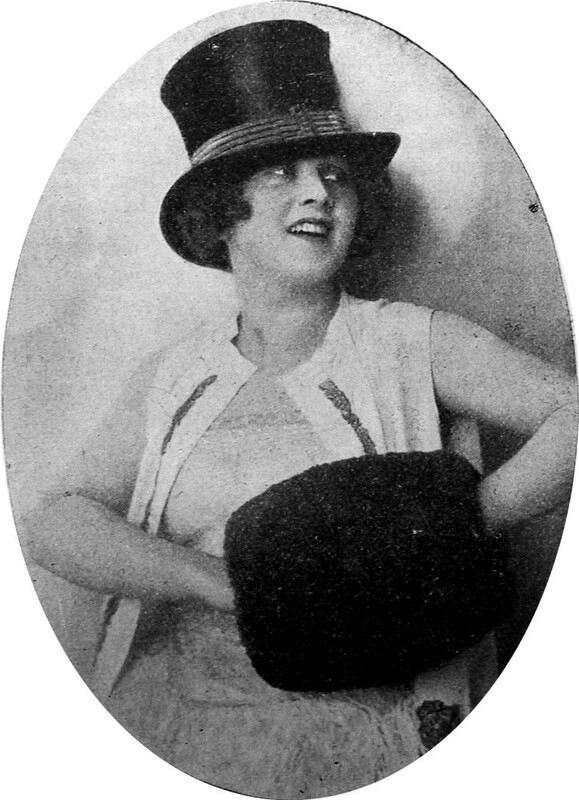 Soubrette Elsie Altman played Mabel in the 1926 production of “Zirkusprinzessin,” a cheeky pseudo-English artist with a dog act. For the rest: youth and beauty reigned. 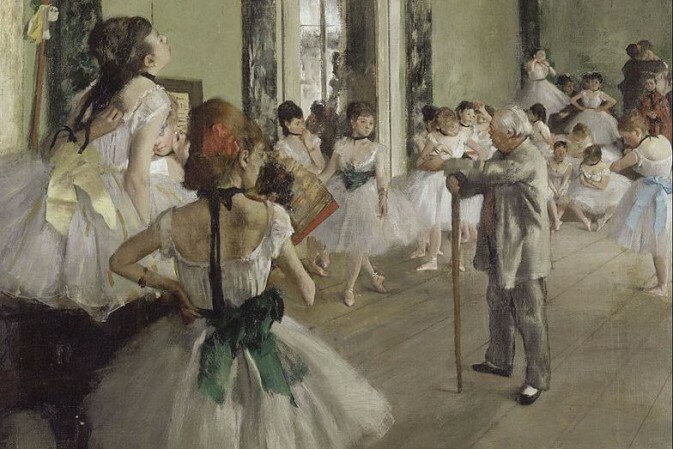 It was the late James G. Huneker who once observed that chorus girls in Viennese operetta theatres must be born old: he had never seen a young one. Times have changed since.